Antibiotic resistance (ABR) is one of the major threats to effective healthcare, with resistance in Enterobacteriaceae emerging as a particular problem in the last decade. In some cases, this family of bacteria have become resistant to every available antimicrobial class. Whilst many species of Enterobacteriaceae, such as Escherichia coli, are both common pathogens and gastrointestinal colonisers, they are also capable of inhabiting a wide range of environmental niches. The genetic diversity of these species is substantial, and understanding the mechanisms of ABR in these bacteria and how resistance in them evolves and spreads is challenging. She is co-PI on the REHAB project (Resistance in the environment: Confluence of human and animal biota). 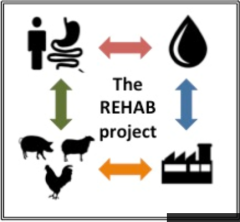 REHAB is a collaboration with the Centre for Ecology and Hydrology, the Animal and Plant Health Agency, Public Health England, and Thames water, and is investigating ABR in Oxfordshire (human colonisation and disease, farmed animals, wastewater and rivers; £1.25 million; AMR cross-council initiative). She also coordinates the TRACE (Transmission of carbapenemase-producing Enterobacteriaceae) project. This joint PHE/Central Manchester Foundation Hospitals NHS Trust study investigates a large-scale, long-term outbreak of very drug-resistant Enterobacteriaceae in the northwest region. Nicole also holds several small project grants analysing the role of hospital wastewater in the transmission of healthcare-associated pathogens. Additional joint studies on ABR are underway with colleagues at US and Canadian institutions, and with several units operating as part of the Oxford Centre for Tropical Medicine and Global Health. Nicole works within the Modernising Medical Microbiology (MMM) consortium, which uses WGS as a tool to diagnose infection and understand the transmission of important infectious pathogens.